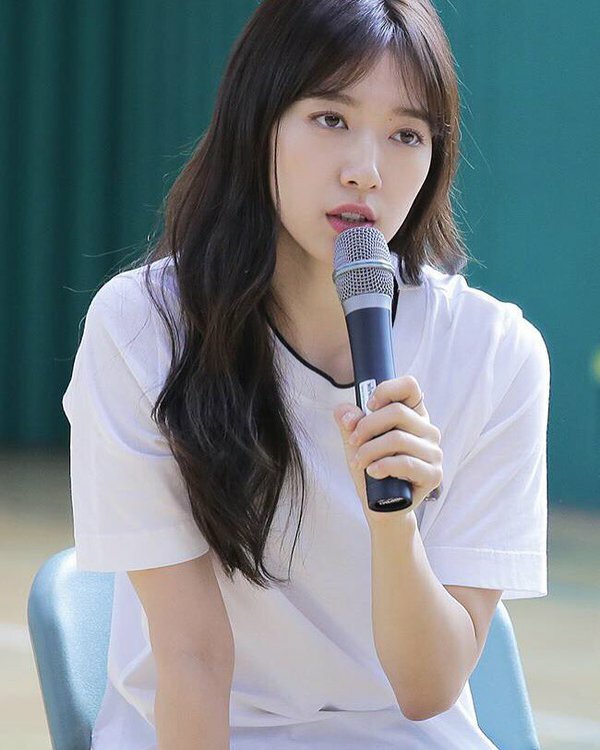 Because of her busy schedule, Shin Hye decided that her 1st fanmeeting in Korea would be a sports event with fans instead of a full-blown stage performance style fanmeeting. She opted for a sports event so that she could have closer interaction with her fans and play with them. The sports event took place on May 14 2016 at an indoors sports stadium (basketball court) in Yongsan, Seoul at 1:00pm. Around 100 fans were present at the event. Upon arrival, fans were giving windbreakers from Millet Korea, the sports brand that Shin Hye endorses. Ladies had orange windbreakers while the gents had blue ones. Fans were divided into 2 teams - the Blue Team and the Red Team. After fans were settled into their teams, the MC (comedian Jo Woo Young) announced the arrival of Shin Hye. There she was, walking into the stadium sporting long, wavy hair with bangs - the new look for her character in her upcoming SBS drama 'Doctors' - and big smiles. She was wearing a white T-shirt, black pants and white Nike shoes. She waved at fans and was happy to see everyone. The MC announced that during the first half of the event, Shin Hye would be the leader of the Red Team (I, the author of this account, was on the Blue Team and Shin Hye's manager was our team leader.) Before the games began, Shin Hye did warm-up exercises with all the participants. Then, a series of mini games were played, and then six main games were played: group rope-skipping, shoe kick, obstacle race, three-legged race, balloon pole building (the two teams competed against each other and see which team could build a taller pole with balloons within a short time) and hula hoop dancing. After 3 main of the above games ended, Shin Hye switched teams with her manager and became the Blue Team's team leader (yay!!!). Shin Hye played in all the games except for the rope-skipping one and the three-legged race. She was so down-to earth that she was the 1st one who started picking up trash after the balloon-pole building game (because after the game, all balloons were popped, leaving streaks of balloon remains everywhere). Oh I gotta mention that while everyone was so eager popping the huge amount of balloons, Shin Hye was half-running away from the balloon poppers covering her ears. It was so cute! The Blue Team was the winning team. After the games ended it was 2:30pm, and everyone sat down onto the ground and had a Q&A session with Shin Hye. 1. About her slim figure. Shin Hye said a lot of people have been asking her whether she's been going on a strict diet because she seems to be getting slimmer and slimmer, but she really has not gone on any crazy diets. Instead, she has been doing a healthy amount of sports and exercises, and she thinks she has just 'grown-up' so she has lost her baby fat. She told fans not to worry about her because she is not going on any crazy diets or eating little. 2. About her new drama. A fan asked whether there will be a lot of crying scenes in 'Doctors', because in her past drama and movie roles Shin Hye had to cry lots. Shin Hye said "really? That seems to be true." She said fans in 'Doctors', she will play a tough girl with a troubled past/got into a lot of trouble when she was in high school. Because it is the first time she takes up a role with such strong personality, she said some people are worried whether she could handle it. She said she picked the role because she really likes the character and really wants to do it, and she will try her best. As she will be playing a doctor in the drama, she will have to learn a lot of English medical terms. A fan asked whether it is difficult learning the English medical terms. She gave a headache-look and said yes, because there are many terms that she needs to memorize and read. At this point, the fans asked if she could give an example, she said "hepa...? hepa something. I cannot remember because we have not progressed to filming at the hospital yet". Right now they are still filming the scenes outside the hospital, the high school scenes, so she hasn't gotten to the medical terms yet. She used to pick dramas that would film in winter/autumn/spring (except for.. Heartstrings?) because it is physically very demanding and straining for actors and actresses to film in the hot weather in summer. However, this drama's shooting takes place in summer and the staff are concerned whether Shin Hye will be ok. Shin Hye said she will try her best to maintain good health and physique so as to withstand the heat. 3. About her new movie 'Hyung' (Brother). A fan asked when will the movie that she filmed last year (October - December 2015) be in theaters. She said because it's summertime, a lot of Hollywood films will be in theaters and it is difficult to find a slot for the movie. If the production company can find theaters with empty slots, then the movie will be in theaters next month. If not, the release date will be postponed. The release date is still undetermined for now. She plays a judo coach in the movie, and she said she had never done judo before, so she learned some judo for the movie role prior to filming last year. Shin Hye said her role in the movie is very strong and she hopes fans will look forward to seeing her in the movie. 4. About family. Shin Hye said she has been busy lately, so she wants to bond with her family whenever she finds time to. Recently, she started playing golf with her father because her father loves playing golf. However, her father wants Shin Hye to achieve perfection in her golf postures and moves, so he is very demanding. Shin Hye laughed and said she felt troubled and decided not to play golf with her father haha. Fans requested Shin Hye to strike a few golfing poses, and she stood up and performed the golf-club swinging motion. 5. About summer plans. Summer is coming soon and Shin Hye was asked what plans she has for the season. Shin Hye said she would like to have a seaside vacation because she loves the ocean, but she thinks she won't have time for that this summer as she will be busy filming for the drama, and after the drama ends she will start her international FM tour. 6. About the sports event. Shin Hye said she had a lot of fun playing with fans at her sports event in 2013, so she wanted to play again this year. However, she couldn't play at her best today because she was worried that she might get an injury which would create inconvenience for the drama crew. This is related to something that happened 3 years ago at the 2013 sports event: they played dodgeball and a fan accidentally threw the ball at Shin Hye's head which hit her with a loud bang, and she was in great pain. But then she was disappointed that we didn't play dodgeball today because she wanted revenge hahaha. 7. About Nike shoes. Shin Hye posted a photo on her IG of her going to a Nike pop-up store event. That event is held all around Seoul these days. Participants could easily win a pair of Nike shoes by participating in the game at the Nike event. Shin Hye said although she was wearing white Nike shoes today, they were not the ones she won at the Nike event. Afterward, Shin Hye took a group photo with fans and left for her filming schedule. *no cameras were allowed inside the venue hall. All photos in this post are reposted from SALT/news websites.